The artistic program for the ninth edition of Scotiabank Nuit Blanche will take place Saturday, October 4 from 6:53 p.m. until sunrise and feature more than 120 art projects created by nearly 400 local, national and international artists. Highlights of the City-produced exhibition projects follow. This year the City-produced component features an engaging lineup of 48 contemporary art projects, the largest number of City-produced projects in the event's history. These are all part of four curated exhibitions. Curated by Dominique Fontaine, an independent curator from Montreal, "Between the earth and the sky, the possibility of everything" features 12 projects in Chinatown and on Queen West. Fontaine's exhibition creates a framework for artistic experimentation that alters basic assumptions about what people see, feel and understand about the world and themselves. The exhibition invites audiences to re-think the possibilities of public spaces. - Global Rainbow from Yvette Mattern is a monumental public light sculpture that beams seven rays of laser lights representing a natural rainbow with a trajectory or viewing spectrum of up to 60 km arcing across the city. The presentation is poetic, magical and powerful. - Maria Ezcurra's Made in China creates a façade in a Chinatown alleyway entrance using local community-donated garments labelled "Made in China." The idea is to build a bridge between two buildings, creating both a physical and a symbolic connection among cultures. - AMAZE transforms an ordinary scaffolding structure into a fully immersive environment of light and sound in the heart of the city. 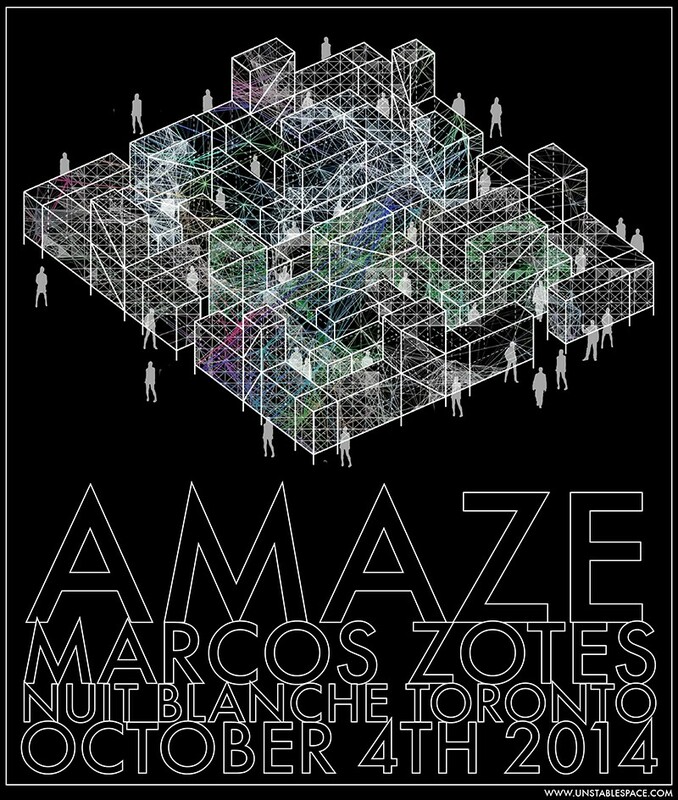 A labyrinth like no other, Marcos Zotes' installation provides a multisensory experience through a personal journey of discovery and transformation. - Chélanie Beaudin-Quintin's Screaming Booth is for those who would like to scream out loud to let off steam and release stress but who dare not for fear of disturbing the peace, appearing crazy, or alarming friends without cause. In this space, no one can hear you scream…or barely. - Nathan Whitford's Shy Lights explores the distinction between spotlight and searchlight by reversing the roles of light and subject. By lighting only the empty space between participants, the lights themselves become the subjects, performers in a playful dance of pursuit and avoidance. Denise Markonish, curator at MASS MoCA in North Adams, Mass., curates the exhibition "The Night Circus," named after and inspired by Erin Morgenstern's book. Featuring 10 projects located in and around Roundhouse Park and along Bremner Boulevard, Markonish's exhibition offers a spectacle of magic, with an aura of darkness bubbling underneath. Artists dazzle, entertain and enchant downtown Toronto during a night circus that vanishes as the dawn breaks. - HOLOSCENES is a performance installation from Lars Jan that is a visceral, visual and public collision of the human body and water. As water rises, a performer swims to the top for air when necessary and dives below to adapt their behaviour to the new aquatic environment. - A continuous, meditative cycling of images explores bodies as capsules of history and perceived progress in Anandam Dancetheatre's Cascade. The project creates a charged space of performative togetherness between audiences and artists. - Diane Landry's Icebreaker sets up an impossible situation, a boat hovering in mid-air, with water seemingly flowing around it – a ghost ship with a single rower, a feat of time, endurance and gravity. - In the tradition of drive-through redwoods and captured great white sharks, Michael Oatman and Brian Kane's social sculpture 8th Wonder is a photo opportunity backdrop, a colossus for a new age and a love letter to that great North American huckster, P.T. Barnum. - FASTWURMS' The Fortune-Teller Machine – Zardoz, allows the audience to meet with cybernetic Witches in a custom-designed nomadic caravan trailer. In exchange for inputs and information, the audience get a personal fortune message and gift. Curated by Magda Gonzalez-Mora, an independent curator in Toronto, "Before Day Break" includes 12 projects located in and around historic Fort York. Gonzalez-Mora's exhibition examines the intricacy of everyday life and the perception of reality. Through these works, the artists reflect on different conditions that impact our ability to understand the world. - Yoan Capote's Open Mind is a labyrinth based on a drawing of the human brain that people can walk through, acting as metaphors for neurons transmitting information. This work inspires dialogue on the human need for tolerance and acceptance in a global world. - This latest work from Antoni Muntadas entitled Good News, examines the duality of media as a source of information and an instrument of manipulation. The piece displays a wide range of headlines in order to create a defiance in the uniformly constructed "media flow." - Part installation, part sociological survey, Between Doors from Labspace Studio invites audiences into an evolving narrative on the nature of choice. Confronted by a series of free-standing doorways, participants are asked to make a choice; for every decision there lies a doorway; through that doorway, another set of doorways and another set of choices. - Conga Irreversible perfectly illustrates Los Carpenteros' strategy as artists, using irony to replace direct criticism. This video installation features 100 professional Cuban dancers in outlandish black outfits doing the conga in reverse. - Kelly Mark's live performance and video installation Everything and Nothing, takes the form of a back and forth dialogue between a man and a woman. The exchange continues until they have recited one hundred phrases each, repeated in reverse order, to create an endless loop. Heather Pesanti, senior curator at the Contemporary Austin in Austin, offers an exclusive performance-based exhibition for the first time ever at Scotiabank Nuit Blanche called "Performance Anxiety." Curated in the spirit of symphony, events will take place throughout the night at Toronto City Hall and Nathan Phillips Square. Pesanti's exhibition reflects the sensation and emotion an individual feels when facing the public. - Tony Conrad collaborates with Jennifer Walshe to present THE SIGNING, a street spectacle shadow-opera that centres on the tension enacted in the signing of a document. The project uses shadow puppetry, voice, violin, electronics and projections. - For Wanwu: Metamorphosis, Bingyi creates a large-scale painting under a halo of intense green light. The painting is completed, then dissolved by water while an operatic performance occurs throughout the night. - Kathryn Andrews collaborates with Scott Benzel to transform City Hall's multilayered interior into an inverted theatre with Split Chorale for Viljo Revell. Visitors watch a panoply of video montages floating on the structure’s central stalk, while simultaneously being viewed by a legion of choral singers engaged in a marathon drone. - With Halflife, Shasti O'Leary Soudant creates a theatre of spectacle based on the notion of contagion. The artist empowers 100 glowing "carriers" to disperse throughout the city and "infect" willing participants with invisible UV reactive ink markers, peaking in a mass convergence on the Square.